Side shuffle like a pro! Football players routinely incorporate side shuffles into their practices. The move works the muscles of the inner and outer thighs while also revving up your cardio workout. Walk backwards (where it’s safe). You’ll use different muscles than you’re accustomed to using while walking normally. This will work the front of your legs more, which will burn slightly more calories and balance out your leg musculature at the same time! For an extra quad burn, walk backwards uphill! Walk/run intervals. Interval walking and running can give you a great cardiovascular workout while sparing your joints. Research has shown that shorter duration cardio workouts that incorporate short bursts of speed can be just as, or MORE effective than, longer workouts at a steady pace. The shorter duration and incorporation of low-intensity walking help to decrease pounding on the joints. Walk/march. For the less easily intimidated, walk normally, and then every 5 steps bring one knee up to meet the opposite elbow. Repeat on the other side. For a more advanced version, run for 5 full steps (left/ right), and then do same knee to elbow movement from above with a little hop. Great blog on walking.. thank you .. 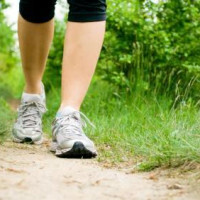 I walk everyday and love the reminders about walking backwards up hill.. not sure what he side shuffle looks like but will research that.. meanwhile an extra tip to know about when doing short bursts of running, then walking.. it lowers your tri-glycerides better than any sustained exercise.. thank you!